Dutch ovens are cylindrical, heavy gauge cooking pots with tight-fitting lids that can be used either on a range top or in the oven. The heavy metal or ceramic construction provides constant, even, and multi-directional radiant heat to the food being cooked inside. With a wide range of uses, Dutch ovens are truly an all-purpose piece of cookware. Dutch ovens, as they are called in the United States today, have been used for hundreds of years, in many different cultures, and under many names. This most basic piece of cookware was originally designed with feet to sit above hot ashes in a wood or coal burning fireplace. The lids of Dutch ovens were at one time slightly concave so that hot coals could be placed on top to provide heat from above as well as below. In France, these multi-use pots are known as cocottes, and in Brittan, they are known simply as casseroles. Modern Dutch ovens can be used on a stovetop similar to a stockpot or in the oven like a baking dish. The heavy gauge metal or ceramic can withstand a wide range of temperatures and cooking methods. Almost any cooking task can be performed in a Dutch oven. Soups and stews: Dutch ovens are perfect for soups and stews because of their size, shape, and thick construction. 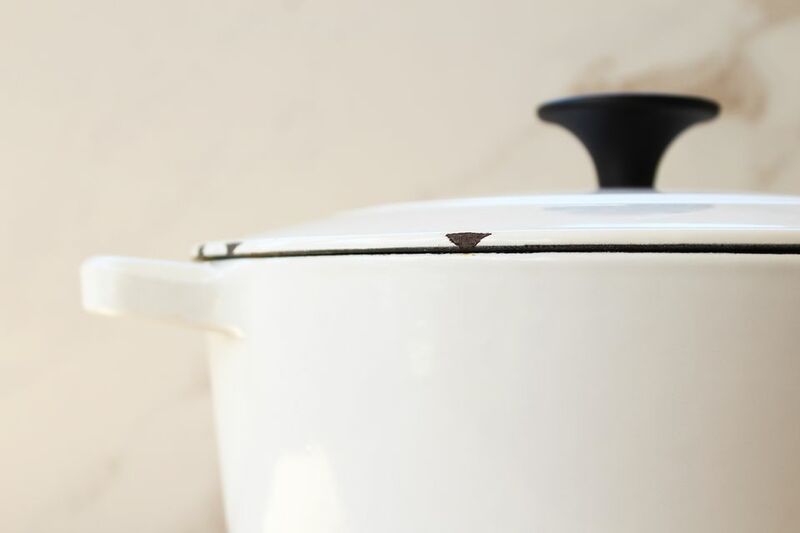 The heavy metal or ceramic conducts heat well and can keep food warm for long periods of time. This is useful for long-simmering soups, stews, or beans. Roasting: When placed inside an oven, Dutch ovens conduct heat and transfer it to the food inside from all directions. The ability of the cookware to hold this heat means that less energy is required for long, slow cooking methods. The ovenproof lid helps retain moisture and prevents drying during long cooking times. This makes Dutch ovens perfect for slow roasting meats or vegetables. Frying: The ability to conduct heat is the star again when it comes to using a Dutch oven for deep-frying. Dutch ovens will heat oil evenly, allowing the cook to closely control the temperature of the fry oil. There are some enameled Dutch ovens should not be used with the high temperatures used in deep frying, so be sure to check with the manufacturer. Bread: Dutch ovens have also long been used to bake bread and other baked goods. The radiant heat acts similarly to a stone hearth of a bread or pizza oven. Furthermore, the lid holds in moisture and steam, which creates a desirably crispy crust. Casseroles: The ability of a Dutch oven to be transferred from a stovetop to inside an oven makes them the perfect tool for casseroles. Meats or aromatics can be sautéed in the Dutch oven while on the stovetop, and then the casserole can be assembled and baked in the very same pot. Modern Dutch ovens can be divided into two basic categories: bare cast iron or enameled. Each has its own set of advantages, disadvantages, and best uses. Bare cast iron: Cast iron is an excellent conductor of heat and is the preferred cookware material for many chefs. The metal can withstand extremely high temperatures without degradation, making it useful for a wider variety of applications. As with all cast iron cookware, special cleaning and care must be taken to preserve the integrity of the iron. If cared for properly, a good cast iron Dutch oven can last generations. Cast iron Dutch ovens are commonly used for camping as they can be placed directly over an open flame. Enameled: Enameled Dutch ovens can have a ceramic or metal (cast iron or aluminum) core. Like cast iron, ceramic conducts heat extremely well and is therefore often used to make Dutch ovens. Enameled Dutch ovens require no special cleaning techniques, which makes them perfect for those seeking convenience. Although enamel is extremely durable, some enamel is not made to withstand extremely high temperatures so it is always best to check with the manufacturer. Dutch ovens have gained popularity over the past few decades and can now be found in most major home retailers. Le Creuset is perhaps one of the most well-known manufacturers of Dutch ovens and offers a wide range of colorful enameled cast iron Dutch ovens. With a hefty price tag, Le Creuset Dutch ovens can be found at high-end cooking supply stores or home retailers. Lodge, the popular manufacturer of cast iron cookware is also well known for its quality cast iron Dutch ovens. Lodge Dutch ovens can be purchased at camping supply stores, outdoor sports centers, and many other retailers. There are many other brands of Dutch ovens on the market with a wide range of prices. A quality Dutch oven should feel very heavy, indicating its solid construction and heat conducting capabilities. The walls should be relatively thick and the lid should fit tightly. All hardware should be oven safe and attached securely. What is a Dutch Oven and What Kind of Cooking is it Good For? Serving Fish or Seafood? Make Sure You Have the Right Tools! What is a BBQ Mop?